The flying humanoid phenomenon has been reported for millennia, starting with the tales of ancient gods. The writings of Charles Fort and John Keel, as well as current cryptozoologists, suggests that these sightings are more than myths and folklore. The rain stopped, the temperature of the air remained low and the mist appeared over the water. It was then that I saw the mark on the path that was very similar to a man's footprint. My dog Alpha bristled up, snarled, and then something rushed about nearby trampling among the bushes. However, it didn't go away, but stopped nearby, standing stock-still. We had been standing like that for some minutes.... Then I stooped, picked up a stone and threw it towards the unknown animal. Then something happened that was quite unexpected: I heard the beating of wings. Something large and dark emerged from the fog and flew over the river. A moment later it disappeared in the dense mist. My dog, badly frightened, pressed itself to my feet. During the encounter, I was driving towards Ottawa, northbound on the 416 Memorial Highway, it was about 12:20 in the afternoon on a clear sunny but very windy day. When I noticed at first what I thought was a huge seagull about 200 feet in the air ahead of me. Within seconds I noticed the wings did not match the initial interpretation I had made and then saw outstretched arms, a head and torso with legs tucked together in a horizontal orientation. The wings, I could see now as I drove towards it at near 120 km/hr, were pure white and very large, its wings moved up and down rather slowly each doing a nearly 180 degree movement up and down. One of the most beautiful things I've ever seen, I estimate its full wing span at 25-30 feet as one of my thoughts during the sighting was that the wings appeared too big for its body and I wondered how such long wings would be stored when the creature was walking on the ground. So during these observations my car was steadily heading towards this thing that was also descending, bringing it into extremely clear view. The road turns a few times changing my initial straight ahead view to an up and to the right line of sight, eventually being directly adjacent to me when it landed about 75 feet from my car. So, now that I was looking to my right I could see it coming down to tree top level, still in a horizontal body position, gliding a bit more than flapping its wings like when it was higher. The sun light up the white feathers and the wings appeared grey underneath due to the sun and their shadow. The part that still sends chills down my spine was the being's human like characteristics yet not being like any human. He was The color of dark wet clay, face, lips arms legs and all. He was also 12-15 feet tall judging by his height compared to the trees around him. His physical stature would make a 12 foot tall bodybuilder look like a scrawny pipsqueak. The mass and size of its muscles were beast like and very powerful looking. I remember it looking over and down towards us on the highway and the look terrified me. It looked at us like we do unto ants, but with a certain disdain in its glance. The best look at his face was when he actually landed, at this point he dropped his body to a vertical orientation and out stretched his wings to land...curiously i could see that in the heavy winds he was having some trouble. His legs and arms seemed to be being used as counterbalance but the giant wings were catching a lot of wind making him not completely stable upon final decent as his limbs were awkwardly jockeying for a balance point as his wings acted like a massive sail. At this time I could clearly see the inner feathers blowing feverishly in the wind, down-like and soft, while the further to the outside of the wing I looked, the longer, stiffer and more defined the feathers became. So stiff longer feathers around the edges and down like feathers in the inner parts of the wing's undersides. I'd thought in mythological cartoon like terms that they were supposed to magically ascend with light and singing etc, but not the case here, where it was clearly affected by and had to follow the laws of nature from what I saw. It had no facial hair, but wore some type of headdress grey in color and had like braided or dreaded looking (pigtails?) coming out from under its hat on either side of its neck, behind the ears going to the back of its shoulders. I could see around its neck that it wore some type of robe matching its skin in color and being thin enough that I could see its muscles right through it, when landing i could clearly see each of its legs so it was probably kilt like on the bottom half of the garment. He did not appear friendly or welcoming, the last seconds I could see him, was of his ominous glare towards my direction through my back window as I passed at moment of it's touchdown. His nose and upper eye socket ridges cast a black shadow over portions of its clay colored warrior looking face. It looked like he was here for a definite reason and the fact that we on the road could see him did not seem to bother it at all, at this point I lost visual contact due to converging tree lines between it and myself just before looking ahead at a road sign reading "exit 66 ahead", seconds after that I could see buildings in the south end of Ottawa for the first time, this thing literally landed as close to our nations capital as it could while still having fields with trees block it for cover. If you look on Google Maps, it landed in the field along the north side of the 416 Hwy west of where Cambridge and Cedarview Roads intersect and south of the river winding west to east. The being was both the most beautiful and most terrifying thing I've ever seen. It has affected my life in a substantial and eventually positive way, but I live with some regret having not slamming my brakes and running to it, even if it had destroyed me. I would at least know more than I can find out now, but the fear and shock was gripping and I was unable to make sense of or overcome it at the time. My plan was to take exit 66 and backtrack towards it, but found out that road was about 8+ minutes ahead at which point I thought the being would be gone by the time I winded through town and found the way to that location again, so regrettably that was the end of the experience. I only took my eyes off it once, when another vehicle in the lane to my right came nearly into my lane as I was also distracted and veering close to his lane We seem to have both noticed at the same time, corrected our steering, made a half second of eye contact and both looked back up at it in the sky simultaneously at that point. He was driving a late 90's Buick of burgundy color and appeared to be mid a 40's Middle Eastern man with a buzzed haircut. It has taken me years to come forward with what I saw and I've still only shared it with a handful of people until now, due to the stigma and rarity of these events they are not as easily received by others as say reports of flashing lights or disc shaped objects. I am not and was not religious (though I do now have ultimate faith), thus was not predisposed to wanting to see anything like this at the time, I did not really think about or believe in angels at all before the encounter, but can no longer deny their physical existence, only our understanding of them. My goal is to find others on that busy highway that day that I know saw it as well. (there were at least 15 other cars in close proximity to myself). Before this event I would have found it very difficult to believe such an account from another person even if they were close to me. Understanding this, I'm uncertain how to best convey the event to you in a way that I would have been receptive to if that's even possible to share fully in words without seeing it for yourself. 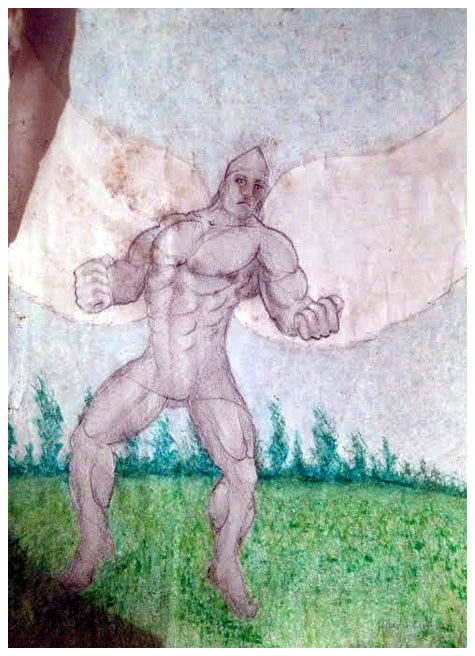 I swear on my family, to The Most High that my description of and sighting of this giant winged being are true and as accurate as possible, thank you for listening.